Which Retrofit Kit Works Best for Your Gun Safe? If you want to upgrade your current gun safe, protect your valuable firearms from damage, or organize your weapons for quick access — the Retrofit kits will help you do that. We have a few different options to fit different needs. All of the kits come with hardware to attach them to the inside of a safe. Specifically, 4 drywall anchors and 4 sheetrock screws. The smallest kit is the Retrofit Kit 2, it’s great for organizing your tactical weapons for quick access or deployment. Sometimes our customers will outfit half of their safe with a Retrofit Kit 2 for their MSRs and keep their lever actions or shotguns in the old half of their safe. The Retrofit Kit 2 uses an injection-molded olefin grid wall, which is rated for the same weight as the steel panel but is much lighter. You will need at least 6″ of space to install the Retrofit Kit 2. 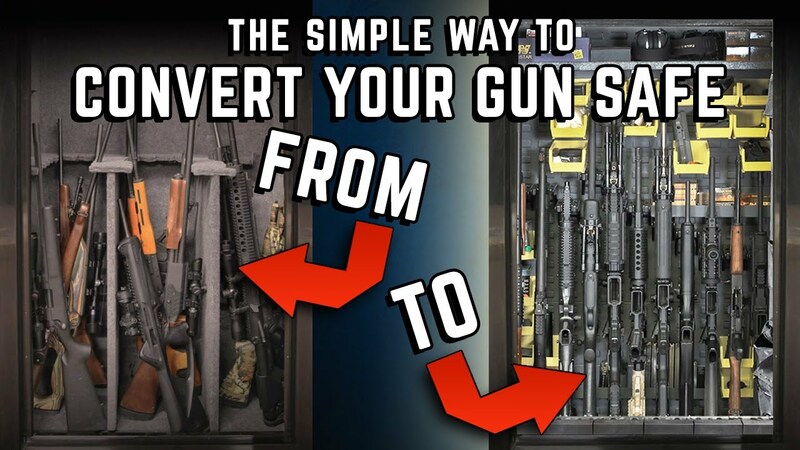 If you need more rifle storage then consider the Retrofit Kit 6 which allows you to completely retrofit a safe and store 6 rifles or shotguns. The Retrofit Kit 6 uses the same type of grid as the Retrofit Kit 2, and each grid has a tongue-in-groove design that locks them together on the wall. The Retrofit Kit 6 needs 17.5″ of space in your safe, however, it comes in 3 pieces just under 6″ each so you can break it up as you need to. If you don’t feel comfortable fastening the grid wall into your safe with screws, the Retrofit Kits are the best option as you can attach them with Velcro, double-sided tape, or a construction adhesive. If you have a lot of gear, mags, or just need more storage space, take a look at the Steel Retrofit kits. The Steel 6 comes with the components to store 6 rifles and has two panels that give you a lot of space to use accessories. The biggest kit, for the ultimate upgrade in your existing safe, is our Steel 12. It comes with 2 large panels, both store 6 rifles, and has enough real estate for Metal Storage Trays, Bins, or some Pistol Pegs. The Steel 12 spans a total of 34.5″ wide, but each panel is 17.25″ wide by 36″ tall so you can install them in two areas, or put them together. The Steel kits also come with hardware to attach them to the inside of your safe, and we recommend using the screws due to the panel weight and potential accessory storage weight. Click here to shop all gun safe conversion kits.